Our oil, bottled in glass, is available in a variety of sizes: half-pint, pint, ½ gallon, 1 gallon. There’s lots of ways for you to purchase our sunflower oil! You can find our oil in many food coops and specialty stores throughout Southwestern Wisconsin and the Twin Cities area of Minnesota. 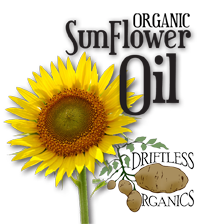 If you are a restaurant or cafe and have an interest in buying in bulk, please contact Driftless Organics directly.